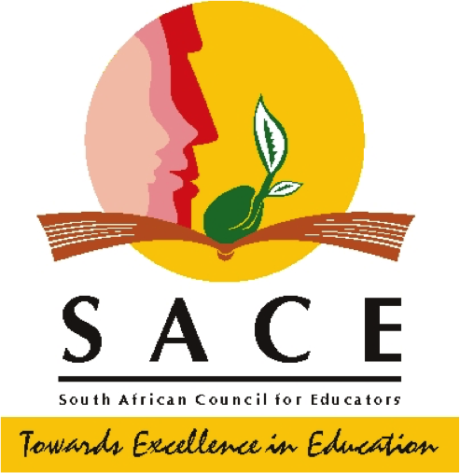 This guide is aimed at giving assistance to teachers on how to use the SACE Continuing Professional Teacher Development (CPTD) Self-Service portal. Once the web browser is open, click on the CPTD-IS TAB. It will take you to the CPTD IS portal, then choose Educator sign up. 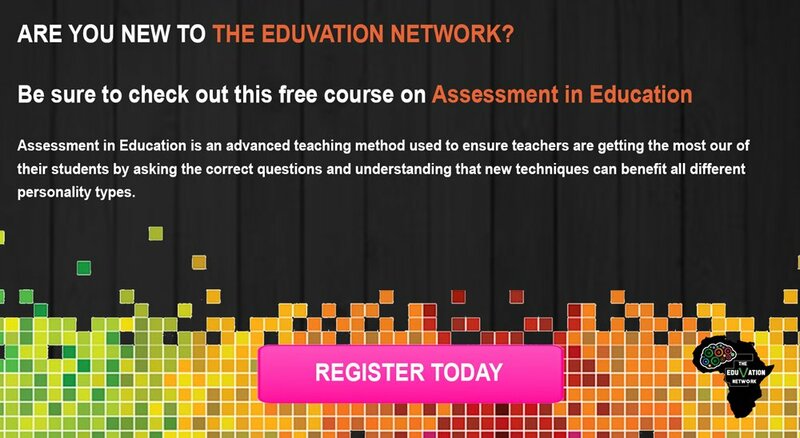 Enter all required details as listed on the educator sign up page. Captchais used for security purposes to verify that it is a human being who is using the system. Make sure that you fill in the red textboxes as they are mandatory or required. After login, you can continue capturing all the fields displayed on the page. Please note that BOTH your SACE Registration number and ID/Passport Number are compulsory. 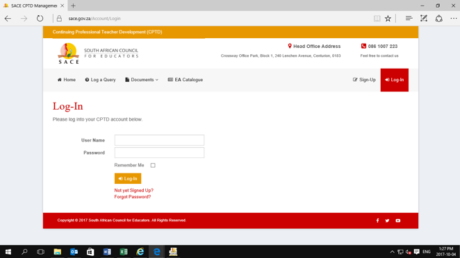 If you are already signed up onto the CPTD IS, you can click on Already Signed Up, and this will direct you to the login page. If you have forgotten your username or password, you can click on forgot username and password, it will the redirect you to a page where you capture your SACE number and cellphone number, or alternatively, you can log a query. Step 1: Click on the LOGIN TAB. 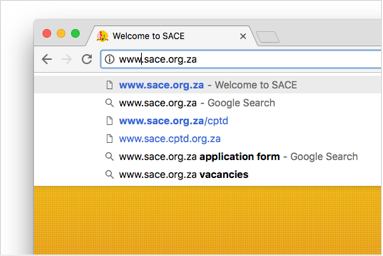 Step 2: Enter your SACE CPTD Username and password. Step 3: Click on the Login Button to proceed to the next page. If you have not yet signed up, click on the red phrase written “Not yet signed up?” which will take you to step 3 till step 9, and this phrase will appear under the username and password textboxes on the Log In page. If you have forgotten your password, click on the red phrase written Forgot Your Password?Under the LOGIN TAB, which will take you to the next page, where you will have to fill in your SACE Number and *Cellphone number so that your password can be sent to you. 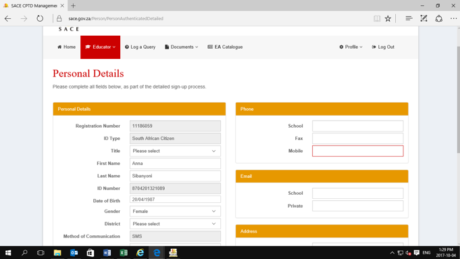 Step 1: After logging in, Click on the Educator TAB and select Update Your Personal Details from the drop down list. Step 2: Fill all the fields that might have changed on this page and click on the Save Button. Make sure that you fill in the red textboxes as they are mandatory or required.. 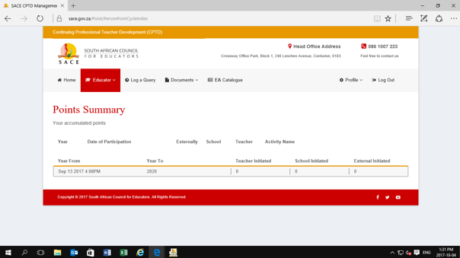 Step 1: Click on the Educator TAB and select Qualification from the drop down list. Step 2: Click on the Add Obtained Qualification(s). Step 3: Select the Qualification Category. 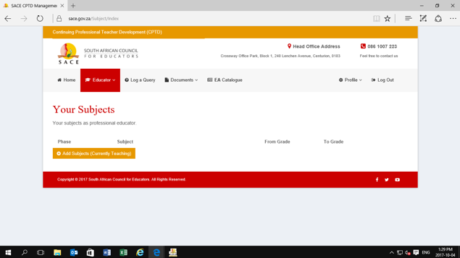 Step 4: Qualification Type Search is a search advance that allows you to type in your obtained qualification whether in full or half a word, and it will automatically retrieve all Qualification name similar or exactly the one you typed. Step 5: Click on the Qualification name and it will automatically reflect to the Selected Qualification Type textbox. NOTE: In order to select more than one option, hold down the control (ctrl) button. Step 7: Capture the Year Obtained. Step 8: Type in the name of the institution in which you have obtained the Qualification from on the Institution Type Search. Institution Type Search is asearch advance that allows a user to type in the name of the institution whether in full or half a word,and it will automatically retrieve all institution name similar or exactly the one you typed. STEP 9: Once you have selected the name of the institution it should automatically reflect on the Selected Institution textbox. Step 10: Click on the Submit Button to save the qualification. Step 1: Click on the Educator TAB and select SUBJECT from the drop down list. Step 2: Click on Add Subjects. Step 3: Complete the required field. Step 4: Type in the name of the subject that you currently teaching on the subject Type Search. Step 6: Click on the Submit Button to save your activity. 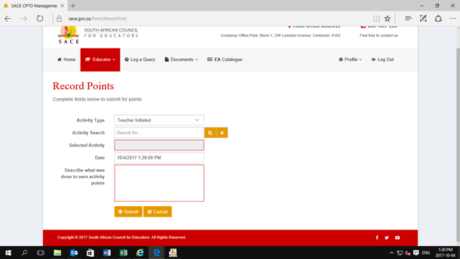 Click on the Educator TAB and select Record you Points from the drop down list. Step 2: Type the name of activity on the Activity type search. Step 3: The activity name should reflect on the Selected Activity Textbox. Step 4: There is a textbox that you have to use to describewhat was done to earn activity points. Step 5: Choose the date in which you participated the activity on the calendar. Step6: Click on the Submit Button to save your activity. Step 6: The system should take you straight to the Activities Completed screen. Note: All activities captured should be reflected on this page. All activities recorded should reflect on this page with the correct date in which the activity was participated. Note: There are activities that will reflect immediately on your PD Points account after capturing them e.g. Projects, and there are those that requires a certain number of completion of such activities before they can be reflected on the PD Points Accounts e.g. For teacher Initiated, You have to attend 8 meetings in order to obtain 10 points. See the Professional Development Point Schedule Document on the PD Points by clicking on the Documents Tab which is found on the CPTD IS Home Page. The Total Number of points per Activities should also reflect on the system. Congratulations! 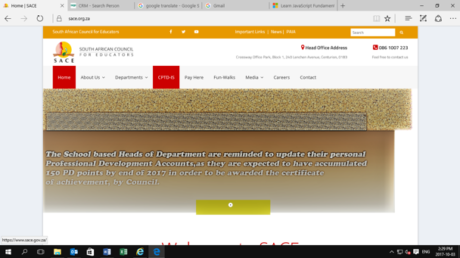 You can now navigate through the self-service portal; update your information; report a CPTD-related problem; etc. The next step is to start earning your CPTD points. Lucky for you, we’ve got some great courses that you can do at home or anywhere else for that matter. If you have any questions, pop us an email and one of our super friendly team members will guide you. 0 responses on "How do you actually get started with SACE?"